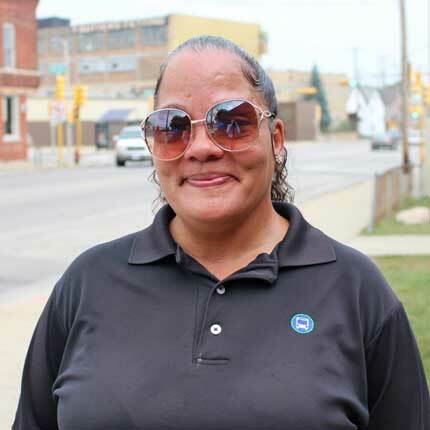 MCTS Driver Diana Serrano was on Lapham Boulevard near I-43 just after 6:00 am on Saturday, August 4th when something in the distance caught her eye. As she got closer, she could not believe what she saw: a little girl was running down the busy street wearing nothing but a t-shirt and underwear. Another passing driver stopped at the same time Diana did. The man picked the little girl up and gave her to Diana. "He told me he had to get to work and couldn't wait around," Diana said. Diana took the crying two-year-old in her arms and got her off the street and onto the bus. Following her training, Diana informed MCTS Dispatch of the situation and asked them to contact police. As she waited for officers to arrive, Diana comforted the girl, talking to her softly and showing her puppy photos that she had on her phone. "One of my daughters recently got a cute puppy and I knew showing the girl some pictures would keep her mind off of the scary situation," Diana said. About 10 minutes after Diana stopped, the little girl's mom walked down the sidewalk looking for her daughter. The relieved woman came on the bus and picked up her daughter. A Milwaukee Police Officer showed up shortly after and Diana explained the situation. Investigators said the girl snuck out of the house while everyone else was asleep. The two-year-old's mother said she is grateful that Diana found her daughter and kept her safe and sound on the bus. This is the eighth lost or missing child that MCTS drivers have found in less than two years. Thank you Diana and all the members of the MCTS team who are serving the community every day. Click here to read more stories of MCTS Excellence.